Copyright © 2006 The Motley Fool. HEADLINE: Did Congress Kill Online Poker? Late last Friday, Congress passed a law aimed at shutting down online gambling in general -- including online poker -- in the United States. Jeff Hwang makes the case that poker isn't a form of gambling any more than buying stock is, and it should be exempt from the new law, as horse racing and state-run lotteries are. I hate politics. I've never been into politics, I never will be, and I'll tell you why. By now, you're probably aware that late last Friday, the U.S. Congress passed The Safe Port Act, a no-brainer bill to improve port security. So no-brainer, in fact, that the vote went 409-to-2 in favor of the bill in the House of Representatives. But attached to that bill was a completely unrelated set of provisions, entitled the "Unlawful Internet Gambling Enforcement Act of 2006," aimed at outlawing Internet gambling -- including online poker -- in the United States. Mind you, this is how things get done in our country, for better or for worse. But according to the Poker Players Alliance, more than 70 million Americans play poker, representing almost a quarter of the U.S. population. 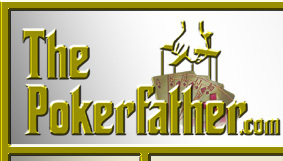 Moreover, roughly one-third of poker-playing Americans play over the Internet. In addition, the game is played legally in public card rooms in Nevada, New Jersey, Florida, California, Washington, Missouri, Mississippi, Iowa, Indiana, Louisiana, Michigan, South Dakota, Michigan, etc., etc. Yet oddly, the new law -- upon its pending signing by President Bush -- protects state-run lotteries and horse racing from the new law, but lumps poker in with the games of chance such as craps and roulette. Frankly, I just find it sickening that such a controversial issue as online gambling was handled with little, if any, debate. Now, the new law won't actually make playing poker online illegal; what it will do is make it illegal for banks and credit card companies to transfer funds from U.S. customers to online gambling sites. And by making it difficult (at the very least) for Americans to deposit cash in online gambling accounts, the law will significantly curb the flow of new cash into the online poker games. The effect is already palpable. Online gambling giants Party Gaming and 888 Holdings -- which do roughly three-quarters and one-half of their business, respectively, in the U.S. -- have already announced that they will stop accepting business from U.S.-based customers once the President signs the bill into law. Sportingbet has announced that it will no longer pursue a merger with World Gaming. And nearly all of the U.K.-based online gaming companies saw their share prices more than halved in Monday trading, while Motley Fool Hidden Gems selection Cryptologic (Nasdaq: CRYP) -- which does less than 30% of its business in the United States -- saw its shares drop 18%. Legislation regarding online gambling in the U.S. was inevitable, particularly with the recent explosion in the growth of online poker. However, the answer isn't prohibition. First of all, the bill's specific exemption of horse racing and state-run lotteries, but not poker, must be predicated on the argument that poker represents a form of gambling. But is poker really gambling? The answer really depends on the player. Personally, I don't think poker is all that different from buying stocks. If you're patient and you've got a sound strategy, you're going to beat the market in the long run. The same applies to poker. If you trade too much and frequently speculate on trash stocks, you are probably going to have relatively poor results in the stock market. If you play too many hands, you're probably going to lose at poker. 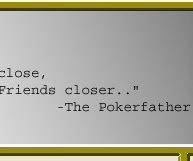 In truth, the people who call poker a game of chance either have never played or probably just aren't very good at it. 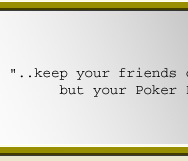 Granted, it's also probably true that a lot of people who think they are good at poker are, in fact, gambling. But if you look at it that way, poker isn't gambling any more than buying stocks is. Of course, I don't really think of the lottery as gambling, either (It isn't gambling if you know you're going to lose, right?). Last I checked, buying stocks online wasn't illegal, and playing poker online shouldn't be targeted for death, either. As Mike McDermott said in Rounders: "Why do you think the same five guys make it to the final table of the World Series of Poker every year? What, are they the luckiest guys in Las Vegas?" "Prohibition's effect on alcohol prices was said to be on the order of a 275-fold increase within a year, and almost zero decrease in consumption of the now-illegal product. Does anyone believe that Americans en masse will stop gambling online, especially since there won't be any penalties for players? (Yeah, me neither.)" Americans will continue to play online poker, albeit at a reduced rate (Americans still have brick-and-mortar card rooms to turn to). But that's not what the U.S. government should be concerned about; in my opinion, the real issue is that U.S. citizens account for the bulk of the $13 billion worldwide online gaming industry, yet the U.S. government receives zero tax dollars. And it's not because the online casino operators are nefarious thieves -- for the most part, the publicly traded online gaming companies are reputable businesses regulated by the respectable stock exchanges in the U.K. The reality is that the U.S. online gaming market is so profitable that these gaming companies would gladly share their profits and pay taxes in the U.S. By one estimate, the U.S. government is losing $3.3 billion in online gaming-related tax dollars to foreign governments. And if Americans are going to play poker online anyway, doesn't it make more sense to legalize online gambling and regulate it, rather than make a futile attempt to ban it? There are direct parallels to this in the domestic casino market. In Council Bluffs, Iowa, for example -- which is located directly across the river from Omaha -- Nebraskans deposit the bulk of the nearly half a billion dollars in annual gaming revenues generated by the three casinos owned by Harrah's Entertainment (NYSE: HET) and Ameristar Casinos (Nasdaq: ASCA). While Nebraska is loath to legalize full-blown casinos, Nebraskans are going to gamble anyway, and it's inevitable that one day, the state will decide that its residents might as well deposit gaming tax dollars in Nebraska, rather than Iowa. Similarly, rather than watch its residents spend all of their gambling budgets in New Jersey, Pennsylvania legalized as many as 61,000 slots at 14 locations in the state, which the state expects to generate $3 billion in gaming revenue, more than half of which will be paid back in taxes. Ohio faces a similar predicament, as Penn National's (Nasdaq: PENN) Argosy Lawrenceburg -- located in Indiana, roughly 25 miles across the state line from Cincinnati -- is the industry's most successful riverboat casino, partly because of the absence of real competition. The pending introduction of slots in neighboring Pennsylvania will likely speed up gambling legislation in Ohio, in an effort to keep gambling tax dollars within the state. It may be a little sad that these states are somewhat forced, in a way, to legalize gambling, but it makes sense. What can you really do when the propensity to gamble is as human as the propensity to imbibe alcohol? In my opinion, the regulation of online gaming seems to makes a heck of a lot more sense than an attempted ban. It's just not clear to me who this bit of legislation truly benefits, except perhaps a number of politicians up for election in November. Fool contributor Jeff Hwang owns shares of Ameristar Casinos. The Fool has a disclosure policy.